indian rice recipes. rice recipe collection. Rice is singlehandedly the most commonly used grain in the world. It is a grain that is so important because it feeds most of the world. It is a starchy grain which has a grass like appearance. Since rice is is a little bland in taste, you can suit it to your needs and make something sweet, spicy or salty, even though most rice items are savory. It can also be converted into rice flour by grinding it into a fine powder. There are a lot of varieties of rice but here I will be giving you some amazing recipes with plain white rice. Rice is a staple in India and is eaten for both meals, lunch and dinner. So many variations and dishes can be prepared with this, it's insane! In India alone you have pulaos, biryanis, plain dal chawal and what not! A pulao is a one pot rice dish with mild spices and vegetables in it that makes it one wholesome meal. It need not be the most basic with peas and carrots, it can also be innovative like Achaari Paneer Pulao and Corn pulao. As I mentioned before, rice is a staple in the whole of India. To give you a gist, here are a few famous dishes from all over India. Maharashtra has the famous Masala Bhaat mixed with tendli and baingan, Hyderabad has the delectable and irresistible Vegetable Biryani, Kerala has Curd rice which is a cooked rice and curd mixed with a tempering of curry leaves and mustard seeds and Gujarat has the aromatic Vagharela Bhaat! This is a very popular grain in the South Asian countries. The most famous Japanese dish, Sushi, traditionally is seafood wrapped in seaweed and rice, but we can make Vegetarian versions too of which the Carrot and Bell Pepper Sushi is the perfect example. Oriental Curry with Rice is a Thai specialty. Thai curry can be red or green but both has base flavors of lemongrass and coconut and taste the best when served with hot, steaming rice. Massaman Curried Rice is also a Thai preparation but this has more spices than the other. Whenever we think of Chinese food, the first thing that pops in our head is Fried Rice. This delicious preparation of rice with soy sauce, spring onions and other veggies is one of the most like dishes around the world. The middle-east has celebrates rice with by making Date and Rice Pilaf. Creamy Mushroom Risotto is a specialty of Italy. Made with Arborio rice, it is a thick creamy dish which is a main course in itself. Raw rice is an essential ingredient in south Indian cooking. From idlis to dosas, all the batters consist raw rice. This rice, mixed with urad dal is soaked, grinded up into a paste and then kept to ferment overnight. This is the secret to perfect south Indian food. A few dishes to make like this are Plain Dosa, Rice Rava Dosa and Rice and Moong Dal Idli. Pankis are Gujarati rice flour pancakes that are cooked between banana leaves and eaten as snacks, one of my favorites being Green Peas Panki. You can even make Chawal Rotis as a snack to have with pickles if you want a change from the regular rotis, and the best part? It uses the leftover rice as well. Khatta Dhokla which is the staple Gujarati food also uses rice to make the batter. A lot of times we have leftover rice and don’t know what to do with it. In such cases you can turn it into Rice and Besan Pancakes! These hardly take any time to prepare and make the perfect quick snack for everyone! If not pancakes, try make Crispy Rice Balls. These deep fried beauties can be perked with lots of flavorings, sauces and vegetables that your kids will absolutely love! Even though these are mildly spices, you can add chilli according to your preference. A simple mix of rice cooked with vegetables and cheese doesn’t sound too bad right? Cheesy Pepper Rice is ideal for all age groups! Paneer + Rice + Tomatoes gives birth to a beautiful medley of flavors together in a pulao or even a biryani. But there is another way to prepare this as well! Stuffed Tomatoes with Rice and Paneer puts a more international spin to this classic combination and tastes even better. Paal Payassam, is a dessert that is a must serve at all South Indian festivals and weddings. It is a sweet rice kheer flavored with cardamom and saffron that everyone looks forward to eating! Bengalis also have a similar dish called Bengali Payesh which is additionally flavored with bay leaves. Moreover rice can also be used to make puddings and sweet sticky rice. 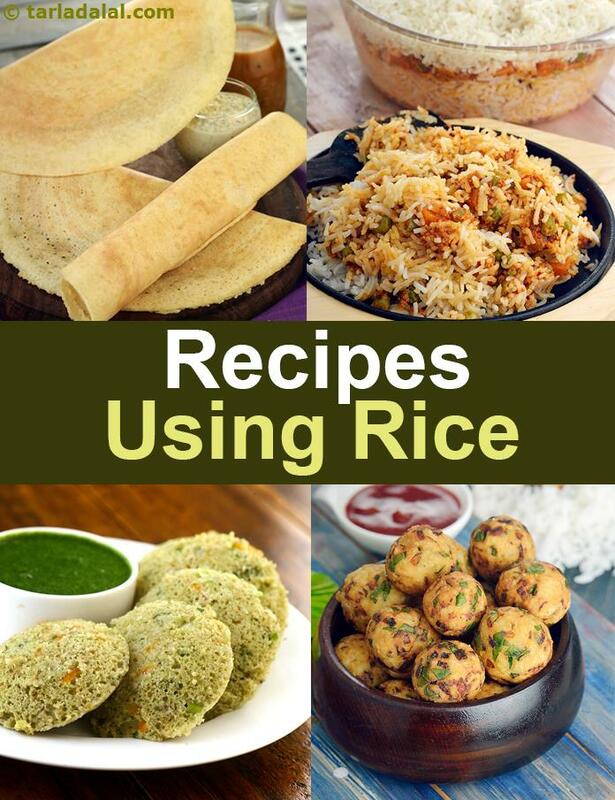 Hope you enjoyed this collection of indian rice recipes, indian rice recipe collection.